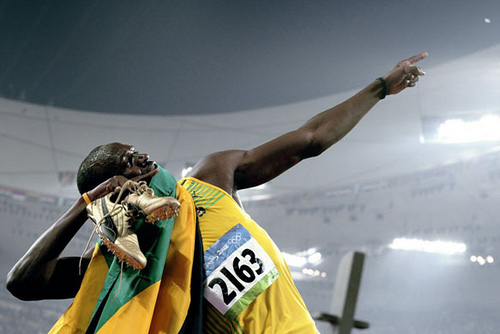 Can Usain Bolt Be Beaten? 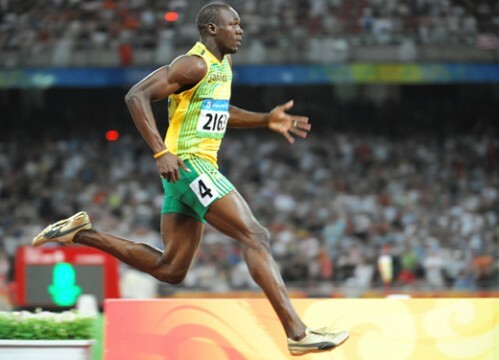 In 2008 the world was awed by the sight of a tall, lanky Jamaican sprinter, with one shoe untied and outstretched arms, as he jogged his way to the title of “World’s Fastest Man” and the gold medal that comes with it. His second gold medal was even more impressive, where he sprinted to the finish at least 5 strides ahead of the rest of the field. Oh, and then there was the minor detail of the massive world records he set in both events. But now 4 years have passed, the Olympics has moved out of Asia and over to Europe, and the question has been raised: Can Usain Bolt be beaten? We will have the official answer as early as August 4th when the preliminary rounds of the 100m begin, but meanwhile, we might as well spend some time speculating. Track, especially the sprints, is a sport of inches and milliseconds. It is completely feasible that Bolt false starts and doesn’t even get to run the race, or tears a hamstring in the prelims and never even makes it to the starting line on the 5th for the 100m final, but assuming nothing goes wrong to that extent, Bolt is the overwhelming favorite going into these games. Some have questioned how he will perform in the Olympics considering he didn’t even win his country’s Olympic trials, where Yohan Blake beat Bolt not once, but twice, in both the 100m and the 200m. Should Bolt be worried because of his performance at the trials? To put it simply, not at all. Anyone who watched the race saw he got off to a poor start in the 100m and still showed great speed closing in on everyone in the field except Blake. In the 200m Blake only beat Bolt by .03 seconds, which amounts to nothing more than a slightly better lean. Perhaps more important than either of those points is the fact that the races happened more than a month before the Olympic games. Anyone who follows track knows the drastic change in fitness that can happen over the course of a month. Bolt was in good enough shape to make the team, and although it would have been nice, his goal for the season isn’t winning the Jamaican Trials. While Bolt shouldn’t be worried because of the trials, there are other competitors who are surely creeping into his visions of another gold in the 100m. I believe there are 5 main challengers to Bolt’s repeat performance: Blake, Asafa Powell, Tyson Gay, Justin Gatlin, and Keston Bledman. Yohan Blake could technically be considered the favorite, considering he’s run the fastest time in the world this year at 9.75, but Bolt’s best on the year is only a one-hundredth of a second behind, and considering he’s the defending champion, I’ll still call Bolt the favorite. As I said, Bolt won’t be worried about his loss to Blake, but Blake has had a phenomenal season and he looks to be peaking at just the right time to dethrone Bolt. It wouldn’t be a stretch to believe Jamaica will go 1, 2 in the 100m, and it really wouldn’t be a surprise if they swept the medals considering Asafa Powell was the face of Jamaican sprinting before Bolt burst onto the scene. 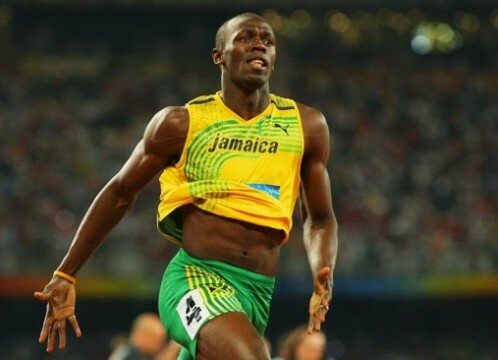 Although he is a notch past his prime, it was his world record that Bolt broke, and he has beaten Bolt before. Powell shouldn’t ever be considered out of contention at an international competition. The Americans, Tyson Gay and Justin Gatlin, are also formidable opponents who have run extremely fast this year. Gatlin, who won gold in 2004, has bounced back from his 4-year steroid ban much better than expected, and is just behind Bolt on the year with a 9.80. Gay has the second fastest time in history, and although it is nearly a full tenth of a second behind Bolt’s world record, Gay beat Bolt in the event back in 2010 in Stockholm. Gay’s 2008 performance surely left him hungry for a better 2012, as he strained his hamstring in the 200m and ran over 10 seconds in the 100m semis, failing to make the finals. This could be Gay’s last Olympics, adding extra motivation for him to be the one to bring home the gold medal. Click below to continue reading.